Artist Ruan Qianrui and Yan Jun of Sub Jam, are collaborating with Christian Krupa and Experimenter En Couleur/Alexis Bamforth for a British Council supported installation resulting in an exhibition in London and Beijing. Sonar 2010, Barcelona - Creating an audio composition from visitors drawings. A gallery where you can browse all the marks left by visitors to Barcelona during the Sonar festival week. When all contributions have been collected they will be processed and data extracted to create a special audio release. 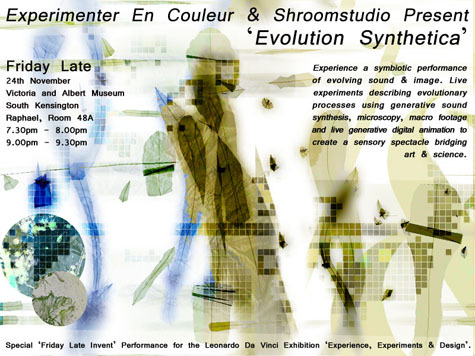 A selection of Din-Collective members present AV, film, music and installations in the wonderful arches of Shunt. For more information on contributors check Din-Collective Din-Collective. A dynamic installation of immersive media, referring to the house of the future. It explores digital tracking and computer technology to control our local environment through interaction with lo-fi inanimate objects. A project that transforms a typical London house through weather patterns. A one year structure-heavy build, that takes its evolving ambience from the elements generative processes. Glass, natural light, artificial light and precipitation are used to transform internal surfaces and our perception of the space we are in. Sound installation for the opening ceremony of the Dashanzi 798 Arts Festival. The piece refers to the history of the district by taking live signals from remnants of the origional services/ductwork, use of mechanical devices and generative computer based machines. 798 Factory. This is Experimenter En Couleur's first collaboration for several years has him working with Chinas renowned sound artist and improvisor Yan Jun & Anding Zhang/ Zafka. Experimenter En Couleur & Shroomstudio have created the special installation for the opening of the new exhibition, 'Experience, Experiment and Design'.